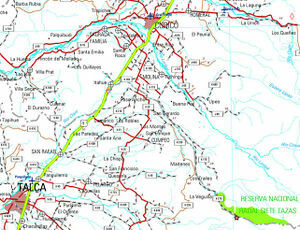 In order to get to the village of Radal and the national park from Talca, you have to leave the city to the East, passing through the settlements of Lo Beño and La Placeta on the way. The first 30 km of this route are paved. The remaining 40 km consist of travelling along a decent-quality gravel road. The road does get narrow in certain spots but it does have passing places, which you might have to pull into, from time to time, in order to allow oncoming traffic to go past you. During the peak season -- largely defined, in this case, as from Christmas time to the end of February -- buses go all the way to Parque Inglés from Molina. These local buses leave from the bus terminal, which is located about half a block away from Molina's main square (Plaza de Armas). If you have any enquiries about the buses then e-mail "Buses Hernandez" buseshernandez@gmail.com. Address: Calle Maipú 1735, Molina. Bear in mind that, for about nine and a half months of the year, these buses only go up as far as the village of Radal, which serves as the entrance to the protected area. A second option is "Buses Radal Siete Tazas", whose buses GENERALLY only run during the months of January and February, and on long public holiday weekends in December. If you miss your bus to the national park and are short of time, you can hitchhike from Valdesina, which is a small settlement on the road between Molina and Radal. You can take a minibus or ("micro") to Valdesina. These minibuses leave from just outside Curicó bus terminal and make a stop at Molina bus terminal on the way. It's just a case of riding one as far beyond Molina as it will take you, and then getting off the minibus before it turns around and heads back the other way. If you can't find a minibus to Valdesina, then just hop on one that has a destination sign on the front that includes the place name "TRES ESQUINAS". These minibuses can at least drop you off on the Molina-Radal road -- specifically, in the settlement of La Palmilla, which is about three kilometres less far up the road than Valdesina. Either way, make it clear to the bus driver that you plan on hitchhiking to Radal/Las Siete Tazas/Parque Inglés, so that he knows where to drop you off. Bear in mind that if you are visiting the national park, without a vehicle, outside of the peak tourist season, then even in the BEST case scenario, you will have to hitchhike into it from the village of Radal. 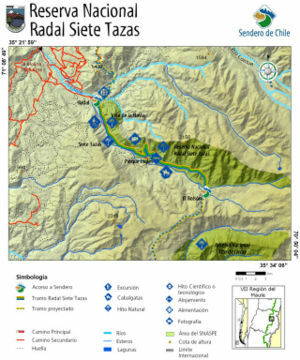 The starting point is the CONAF rangers' office at Parque Inglés (km 0 of the trek - 1100m above sea level). Start the walk by passing around the back of the CONAF base through a turnstile following the signs to the trails. After you get out of the CONAF base, you need to turn right onto a dirt road which then bears around to the left. 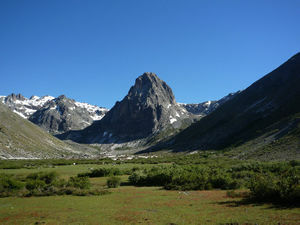 Within 150 m from the CONAF base area, you'll see a path, which exits the dirt road to the right, along with a route sign pointing towards Refugio El Bolsón, and that it's four hours' walk away. This is the trail you want to take. You have to keep following it until you get to Refugio El Bolsón, ignoring all of the secondary paths that you'll see branching off to the sides of the main route as you go along (most notably, Sendero Mala Cara and Sendero La Montañita). Try not to forget this! 🙂 By the way, "sendero" means "path" in Spanish. On the way, you'll see signs saying "3 hours to go", "2 hours to go" and "1 hour to go" -- albeit not in English -- which will give you some idea of how close you are to your destination. Obviously, the time periods that appear on these signs are only rough estimates but they should be reasonably accurate for a person walking at a normal pace. Most of the signs along the route to Refugio El Bolsón are clearly marked and there aren't very many places where you can expect to get lost easily. The opening section of the route is very pleasant. It passes through dense forest and has a relatively flat gradient. After about 20 minutes of walking, you'll get to a small clearing (km 2.4 - 1212m). A few steps further on is a small stream, which gets dried up by the middle of summer. You'll then pass a quincho [= a Chilean wooden gazebo] and a wooden sign with a map on it just ahead of it, in the same clearing. You'll also go past the entrance to Sendero Mala Cara less than 10 minutes later. In km 3.7 of the walk (altitude 1282m), you reach a fork in the trail . You need to take the right fork in order to keep heading towards Refugio El Bolsón instead off veering off left to Sendero Montañita. There are signposts there to help you out. 330 metres further along, you have to cross another stream. You then have to keep following the trail as it winds its way uphill, through the southern beech forest. After another hour's walk, the scenery begins to change. The vegetation thins out considerably and turns into scrubland. At km 7.3 of the trek (1520m above sea level) you have to cross a moderately wide stream, which flows down from Cerro Piuquenes. Just 600 metres further ahead, the trail arrives at the Río Claro, which carries a much greater volume of water and has a very powerful current. DO NOT ATTEMPT TO CROSS THE RIVER, on this particular trek. Just keeping walking along the north bank of it. 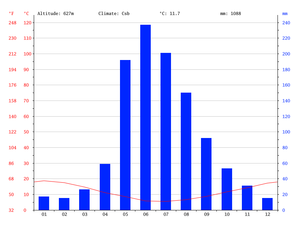 Further on, the climb starts to get a little bit steeper. After a few more minutes of walking the Valle del Indio starts to open up on you. You'll see ñirre shrubs all around, and should be able to make out Cerro Tres Puntas and the Salto del Indio (a waterfall), in the distance. 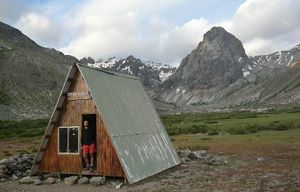 About 45 minutes after you cross the stream, you should get to the small CONAF shelter: "Refugio El Bolsón" [km 10.1 -- Altitude: 1686m], which is also a camping area. There is plenty of space to pitch your tent close to a small brook that flows through the site. This camping spot also offers an outstanding view of a dramatically steep and rocky peak -- the appropriately-named, Colmillo del Diablo [= The Devil's Fang], which is located just two kilometres to the North. In the national park and on the way to it, there are places where you can camp and load up on water. There are waste bins in the campsites. Remember to bring trash bags with you . If you choose to camp in Parque Inglés during the peak summer period, then make sure you keep an eye on your possessions. Opportunistic theft is certainly not unheard of around there during the busy tourist season. If you are looking for more information, click on this link, where you'll find a complete help guide.